From Apples to Oppos: which smartphone brand has the most loyal fan base? Brand loyalty. Consumer familiarity. Fanboyism. We’ve all heard these phrases and formed our own opinions on why smartphones users buy what they buy. Now, new research has revealed just how likely owners of the most popular brands are to switch allegiances. Galaxy A9 official with quad camera, 8GB RAM: this is a mid-range? According to the research, Huawei customers were the most loyal Android users with 54% indicating that they will stick with the Chinese manufacturer with their next device. Huawei is also the most likely destination for iPhone users planning on switching to Android, followed closely by Samsung. Samsung users were the second most loyal, with 53% planning on buying another phone from the Korean manufacturer. 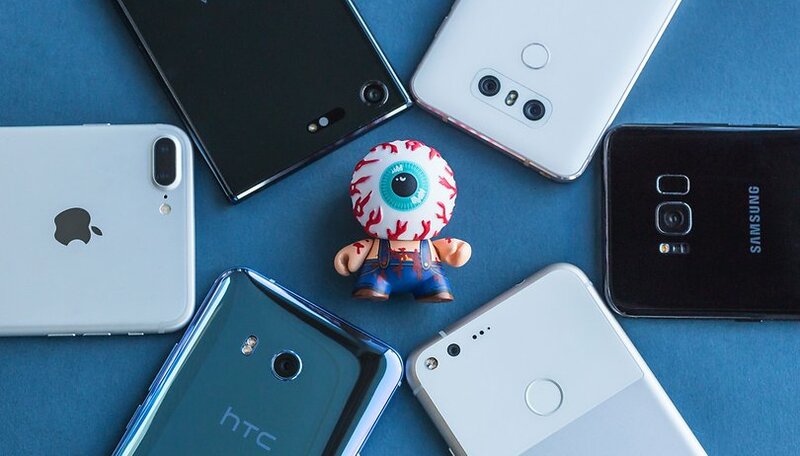 The Android brand with the least loyal fan base was Motorola, with just 11% of those surveyed saying that they intend to stick with the brand with their next smartphone. Motorola One hands-on: is 3 years of updates good enough? What can we take away from the numbers? It’s not a huge surprise that iPhone users are, overall, the most loyal with 70% of current owners indicating that they will stick to Apple when it comes to buying their next smartphone. The buzz around the new iPhone XS and XS Max at the moment might also be a reason for the increased interest in Apple smartphones. This could just be personal, but I get the sense that a lot of iPhone users don't even see their phones as the same thing as Android devices. If you will kindly indulge me for a minute, I recently watched a Greg Davies stand up comedy show on Netflix and I was struck with how often the British comedian referred to "his iPhone" during the set. He never once said "my phone" or "my smartphone" during anecdotes. Sure, he could be on a nice little Bunsen burner for this product placement, but I suspect that he, like so many others wandering this planet, sees his iPhone not as a brand name or one product in a particular market, but as something entirely separate altogether. Of course, if this theory is true, it would explain why Apple has such a high loyalty rating in the Merrill Lynch data. After all, why would you consider switching from an iPhone to an Android if you don't even classify them as the same thing? That's like trying to convince a BMW driver to sell his car and start commuting to work on a smoothie maker! The other huge caveat to this data is that with so much more variation in Android devices, it not surprising that customers change brands more often. I for one have owned Motorola, Honor and Huawei devices over the past couple of years and have enjoyed aspects of each for their individual quirks. There is also no data for Sony. The Japanese manufacturer tends to attract some of the most loyal and vocal smartphone fans on the planet. Just visit one of our YouTube videos on the new XZ3 for the ‘who manufactures the display’ debate and you will see what I’m talking about. Sony fans are among some of the most vocal on the internet. Blackberry’s numbers are kind of interesting, as they support the theory that physical keyboards are still hugely divisive. Around of third of Blackberry owners say they will buy another one, whilst for owners of all other brands, Blackberry devices like the KEY2 are not even on the radar. There are also a couple of things which I believe should encourage readers to take the data with a pinch of salt. Firstly, there is no regional breakdown. I’d love to know, for example, how many of the 40% of OPPO owners that plan to stay loyal are in China rather than Europe. The same goes for those horrifying stats for Motorola. How many of these are in fast-growing markets such as India and Brazil versus regions where the brand is bombing? Where do you fit in on this chart? Are you loyal to your current smartphone brand? Let us know what you have now, and what you are planning to change to in the comments below. I would expect a certain loyal to those who prefer using an iPhone with regards to devices from Apple, but they've had more then one style / type of iPhone to choose from for at least 3 years now (which makes me believe Apple learned from it's competition in that consumers want choices - from screen size to specs). Android has had the luxury of offering a wider selection of devices via Samsung, ZTE, Huawei / Honor, Motorola, Oppo / OnePlus, LG, Sony, Asus (I'm sure there's at least 6 other manufacturers I didn't mention) - how can you complete with that variety? I've already said it before that there is no such thing as brand loyalty. you find the device that offers the specs you're interested in at the price you are willing to pay for (and chances are you will replace this device within 14 to 18 months as technology improves rapidly). In the USA, a LOT of people will continue to purchase their phones from carrier or big box stores. They do this, a lot of them, because they can get it at a reduced initial cost over a 12-24 month period. Me, I'd rather buy outright. The pay a little over time, allows the carriers, big box, manufacturers to continue to price there phones at an absurd level. In the case of Apple, around 60% over the build cost. When you walk into a carrier or box retailer, what are you presented with? Samsung & Apple, along with perhaps to a lesser extent, LG, Motorola, HTC etc. Carrier branding in the USA, is typically Apple/Samsung. So the results of this survey are not surprising. I'm sure in a few years, Huawei will be less in the USA since they were kicked out pretty much, by the FCC this past spring. It's a shame, I've had 3, other than the lack of timely updates, they have been well built phones with a tremendous battery supply. Started with iPhone and had two over the next 2 years. Hate does not begin to describe how I felt about iTunes, Apple was too restrictive, and I refuse to buy from any company, apple or any other, that won't let me do something because they think I'm too stupid to make my own decisions. Been with Android ever since, first HTC Thunderbolt for a couple of years, two or three other brands after that and then Samsung because I love the Note series. I still have my Note 4 and will keep it until it costs more to get it fixed than to buy a new phone. I'm not necessarily brand loyal and I don't know what brand I'll get next, but I am sure that it will be an Android and that I won't spend $1000 to $1500 for a phone that costs less than $400 to make. i refer to my Pixel as "Pixel" and not an Android Smartphone with Android 9 Pie. Or why would somebody say my iOS smartphone of version X. If somebody has a Huawei, they called it that way. And since Apple iphones exist only from that company, what other choices do iOS users have? After maybe 8 or 9 years of music, apps etc purchased on itunes etc, a switch needs to be carefully thought of if you want to move to Android. But switching from a Samsung S9 to a Pixel 3 XL or from a Moto X to a Huawei P20 Pro is not a big deal. It's the newer handset but still you can use all your apps etc. This loyal base chart is really only interesting in the Android area and not iOS. I knew the answer to this one before reading the article. Apple fan are like lemmings always blindly follow what ever they are given. Brand loyalty is a stupid idea. Follow the value, not the label.